It’s been weeks now, I still don’t know what exactly happened to my subscribers. It’s not much but going down from 85 to 1 is really annoying! The first time I noticed that the count was way down, I checked my feeds, thinking it was just an error. But the stats proved it all..See below stats. I tried to do all steps under troubleshootize but still the same. So, my last option was to check the Google/FeedBurner Help Group. I was a little relieved when I checked FeedBurner’s forum and found out that it was not just happening to me. Pardon me, but knowing that someone else have the same problem as mine helps in explaining why I lost my subscribers. It seems that FeedBurner has a glitch. One complained of old posts being sent to subscribers. Another one lost hundreds of subscribers. There was this complaint about email subscriptions deleted, and many more disgruntled bloggers. I browsed the web for the same problem and it seems it happened before, not just once, but it occurred many times. TechCrunch also experienced this problem last January 2009. From their usual 1.7 million Rss feed readers, it dropped way down to 0! Imagine the impact it created to their site! 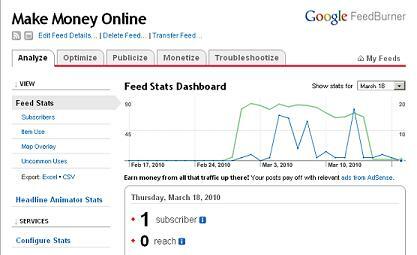 In August 2007, Darren Rowse of Problogger posted an article about fluctuations in subscribers count. Darren was able to get an official statement from Rick Klau, Vice President of FeedBurner Publisher Services. There, he enumerated some reasons why. So, there maybe explanations on why the feed count fluctuates. That’s why there were days, I had a large numbers of subscribers and days where counts dropped. But so far, I haven’t found any answers on why my subscribers were all deleted! I noticed this when I tried to subscribe again on this blog using my primary email address. I know that I have subscribe to my own blog when I started FeedBurner, and I have a copy of my last post, so I was expecting I would be prompted that I am already subscribed. I was dismayed when the service accepted my email address, moreso, when I received the email for the activation link. That means that my subscription was indeed deleted! I asked some of my online friends which I know had subscribed to my feeds and they too received the activation link. I hope to get some answers and try to understand what had happened. It would really be a big help if someone in authority or maybe anybody who really knows what exactly happened could post an article about this. I guess, for now, I would have to live with having just 1 or a few subscribers and hope that those I lost will find this blog again..
How long have you been experiencing it? What exactly happened to your subscribers?